The Philippine Printing House for the Blind (PPHB), in cooperation with the Resources for the Blind, Inc. (RBI), produced textbooks in Braille and in large print. Seven hundred twenty six (726) volumes of Braille textbooks were produced and issued. Textbooks in Braille and in large print were produced by the Philippine Printing House for the Blind (PPHB) in cooperation with the Resources for the Blind (RBI) Inc. through Braille computers. A foundation program for 4-5 year old children who manifest superior intelligence beyond their chronological age, this activity was undertaken to address the educational, aesthetic and social needs of these children and to ascertain how learning challenges will bring out the best from each child. This will help the parents who continuously seek advice from the school and/or teachers on how to meet the needs of their gifted/talented children. Production of 500 copies of Handbooks is on-going. This Handbook responds to the need of SPED teachers, administrators and supervisors handling children and youth with behavior problems. 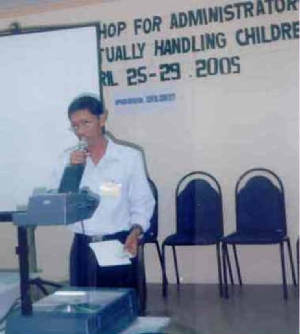 Revision and finalization by experts was undertaken at the Teachers Camp,Baguio City on May 17-21, 2004. Production is tentatively scheduled in April 2005. This Handbook responds to the need of SPED teachers, handling adapted physical education for children and youth with physical disabilities. 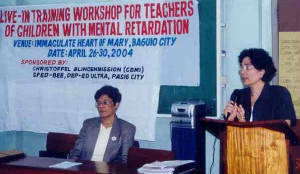 Revision and finalization by experts was undertaken at the Teachers Camp,Baguio City on May 17-21, 2004. Production is tentatively scheduled in April 2005. A total of 500 copies each of the eight learning areas were produced as guide for teachers actually handling children with autism. This learning package is to be utilized by SPED teachers, administrators and supervisors actually handling children with autism. The materials for the blind and low vision especially the textbooks for the elementary and secondary levels are being computerized in Braille and in Large print. PPHB staff encoded and transcribed and proofread these materials. This is a reprinting of the Filipino Adaptation of the Portage Guide to Early Education in collaboration with the Philippine Association for the Retarded. Each set consists of checklist for teaching instruction and a manual of operation. Editing and revision of materials were completed already. This is a scholarship training for administrators and supervisors of regular and special schools/centers/classes, which was offered at the Philippine Normal University, Taft, Manila. It is a non-degree course that runs for one semester with a ten - week practicum while the second and final term is for one summer. It aims to equip administrators and supervisors with a working knowledge on the objectives, philosophy and strategies for inclusion of children with special needs and to provide administrators and supervisors with the knowledge and skills in the management and supervision of special education. There were fifteen (15) administrators and supervisors relates from the divisions of San Carlos City , Nueva Vizcaya, Quezon, Bacolod City, Mandaue city, Tacloban City, Osamiz City, Davao City, Sairgao City and Caloocan City. Ten scholars were funded by the BEE while 5 scholars coming from the SRA provinces such as Capiz, Eastern Samar, Surigao del Sur, Agusan del Sur and CAR were funded by TEEP. 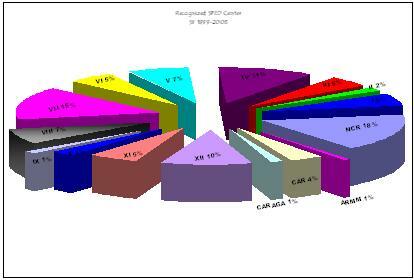 The program will commence in the 2nd semester of 2005. Sixty-five (65) teachers and administrators were trained on Inclusive Education in the Division of Ifugao. The training though not part of the Division Plan, was conducted per request of the division concerned. 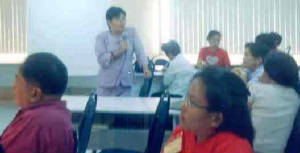 The summer training programs for teachers of the visually impaired were conducted at the following venues: Luzon; 61 teachers attended the training at the Philippine Normal University, Taft Ave. Manila on April 12-May 7, 2004, Visayas; eighteen (18) teachers attended the training at the Cebu Normal University on April 12-May 7, 2004 and for Mindanao; fifteen (15) teachers attended the training at the University of Southeastern Philippines on April 12- May 7, 2004. There were three venues for this training namely: Luzon; forty three (43) teachers attended the training at Immaculate Heart of Mary Retreat House, Baguio City on April 26-30, 2004, Visayas; forty three (43) teachers attended the training at the ECOTECH, Cebu City on May 17-21, 2004 and for Mindanao twenty nine (29) teachers attended the training at RELC , Davao City on April 12-16, 2004.